One of my favorite things to make with summer zucchinis is hobak buchim. 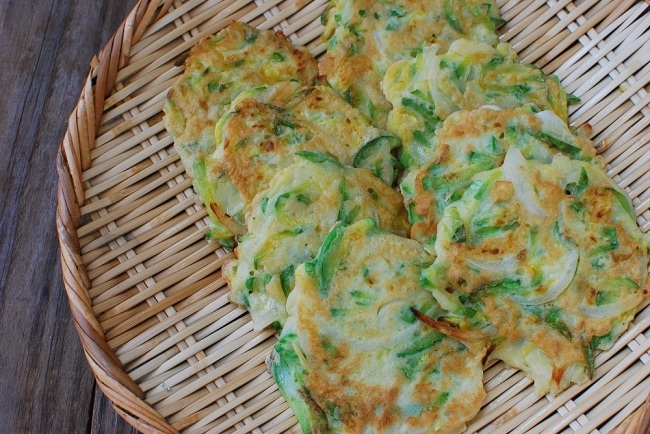 Like pajeon and kimchijeon, hobak buchim (also called buchimgae) is a variation of savory Korean pancakes. You can make this recipe simply with zucchini, or add some other vegetables such as perilla leaves, chili peppers, scallions or onions to complement. I added sliced sweet onions in this recipe. Salt the julienned zucchinis and squeeze out the liquid for a crunchy texture. Save the zucchini-flavored liquid to make the batter. This recipe makes a few small pancakes, but you can make them larger, and then cut them into small pieces before serving, or simply tear them with chopsticks as you eat. Cut the zucchini into match sticks. Place in a bowl and sprinkle with 1/2 teaspoon of salt. Let it sit for about 15 minutes until it is wilted and has released some liquid. Squeeze the liquid out from the zucchini, keeping the liquid in the bowl. Add the onion slices, egg and flour (or buchim garu) to the bowl. Mix well with a spoon. If the zucchini mix is too stiff, add a tablespoon or two of water. Heat a skillet with two tablespoons of oil over medium heat. Add about 2 heaping tablespoons of the batter and spread it evenly into a thin round shape. Depending on the size of the pan, you can cook 4 to 5 pancakes at once. Cook until the bottom is light golden brown, about 2 minutes. Turn it over, adding more oil, and press it down with a spatula. Cook until the other side is light golden brown, about 2 minutes. Repeat the process with the remaining batter. Serve hot with a dipping sauce.